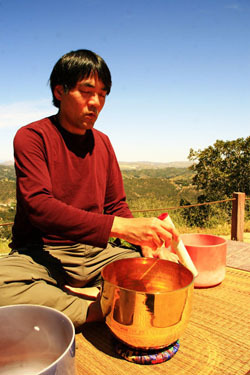 Bruce Manaka, author of "The Alchemy of Bliss" and "Flights of a Runaway Monk" spent 19 years in a monastery, living a life of meditation and contemplation. In his therapeutic sound work, Bruce combines the ancient vocal techniques of overtone singing with the beautiful tones of crystal singing bowls to create dynamic vibratory environments that raises the energy level of everyone present. He experientially shows how sounds and their overtones can create positive and profound changes on all levels. Sound can be a direct path to healing of body, mind and soul through the vibratory alignment that occurs when it is focused with powerful intent. It can serve as a doorway to explore realms of unlimited creativity, vocal power, and inner wisdom. Through resonance and vibration, the wave forms and harmonics created by the crystal singing bowls helps return us to a state of our natural rhythm and frequency. I work with meditators who are frustrated by the lack of depth and joy in their practice. I help them in their meditations to experience the deepest ecstatic realms. I seek to work with those who, like me, feel they have been “charged” to hold and ground the Bliss Resonance for Mother Earth. Please contact me if you’d like to experience the ecstatic current as can be felt deeply in the spine. I offer an initial free session that will be of great benefit for you whether we decide to work together or not.